The terrorist organization Cobra unleashes a new scheme to take over the world, and it's up to the G.I. Joe elite commandos to stop them. Snake-Eyes reflects on his violent past with Storm Shadow. Tunnel Rat and Roadblock battle Destro and the Baroness at Alaska. Cobra makes the first move: they tear apart a GI Joe ship, and later annihilate Moscow. 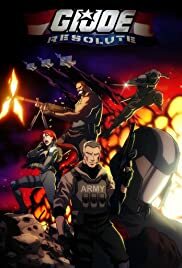 This animated series shows the Joes on the run from the Government, trying to clear their names and stop their evil nemesis, Cobra. The G.I. Joe force learn that Cobra is out to clone a new leader for the organization, making them a greater threat than ever before. The further and darker adventures of the team consisting of DC Comics' greatest superheroes. The further adventures of the DC Universe's greatest superheroes. With the additional help of Cyborg, the greatest DC Comics superheroes continue their battle against the forces of evil. Now with the addition of Firestorm, the Super Friends oppose the forces of evil, especially the evil New God, Darkseid. Cobra Commander: Do not move against me. Do not disobey me. Do as I command and you will receive unimaginable rewards. "G.I. Joe", is one of the greatest franchises ever made. Next to, "Thundercats" and "Transformers". In 2009, Adult Swim did an anime eleven-part miniseries about G.I. Joe. Like the T.V. series, It's pretty much where the Joe's fight Cobra and saving the world from evil. "Resolute", is a great anime miniseries that has nice animation and some good fight scene's. I also like how they made Cobra Commander evil. In the show, whenever he tries to kill someone, his plans are foiled. In, "Resolute", he actually destroy's a city. It also has some nice voice acting from Steve Blum. The only problem's I have is that each episode is about five to nine minutes long and there was not that much development for the other character's. I also wish it was a T.V. series instead of a miniseries. "G.I. Joe: Resolute", is a nice anime take on the classic series and it's worth watching for fans of the series or someone looking for a good short show to watch.